Last visited by Zerver – Jan 2 99The Catskills Mage Tower was moved some time ago. The owner of the previous tower had a change of heart and decided to reclaim it. It is now located in the desert almost due West of the Shrine of Compassion. The Tower was packed with people when I arrived, with much casting and summoning, and none to little *hic*ing going on. There were upwards of 30 people there, and many coming and going. Seems that Cats has been just waiting for such a place to open for the Mages to have a place of their own. Been by several times, and usually there is someone around using the Tower. They are usually willing to help out with new mages. I have seen many willing to go gray by casting firefield, and heal while someone tries to raise thier resist. The Mage Tower was move Moonglow to make it easier to find. 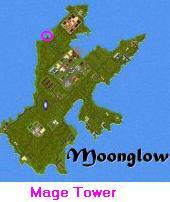 But since there really is no way to every place a tower on Moonglow with the new housing changes, the tower was erected by the GMs on the water. It is supported by 4 pillars of eldrich energy, and connected to the land by float stone.